Background: Discretionary eating behaviour ("snacking") is dependent on internal and external cues. Individual differences in the effects of these cues suggest that some people are more or less likely to snack in certain situations than others. Previous research is limited to laboratory-based experiments or survey-based food recall. 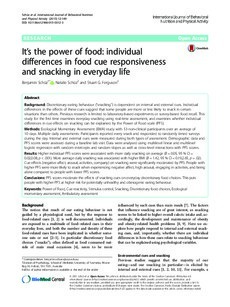 This study for the first time examines everyday snacking using real-time assessment, and examines whether individual differences in cue effects on snacking can be explained by the Power of Food scale (PFS). Methods: Ecological Momentary Assessment (EMA) study with 53 non-clinical participants over an average of 10 days. Multiple daily assessments: Participants reported every snack and responded to randomly timed surveys during the day. Internal and external cues were measured during both types of assessment. Demographic data and PFS scores were assessed during a baseline lab visit. Data were analysed using multilevel linear and multilevel logistic regression with random intercepts and random slopes as well as cross-level interactions with PFS scores. Results: Higher individual PFS scores were associated with more daily snacking on average (B = 0.05, 95 % CI = 0.02,0.08, p < .001). More average daily snacking was associated with higher BMI (B = 1.42, 95 % CI = 0.19,2.65, p = .02). Cue effects (negative affect, arousal, activities, company) on snacking were significantly moderated by PFS: People with higher PFS were more likely to snack when experiencing negative affect, high arousal, engaging in activities, and being alone compared to people with lower PFS scores. Conclusions: PFS scores moderate the effects of snacking cues on everyday discretionary food choices. This puts people with higher PFS at higher risk for potentially unhealthy and obesogenic eating behaviour.